White shirts and blue jeans. Mom, Dad, kiddos. Everyone. All in a line and smiling at the camera. The hair is shellacked and there smiles are a bit too forced. I’ll let that image (it’s probably from the 90s) sink into your brain for a moment. Ok. Now let’s push it far, far away. Why, you ask? Because when I’m sitting in your living room with you for your pre-session consult and we start talking about what to wear, one of the first things I’ll ask is to please not all match in white shirts and blue jeans. Coordinating – yes. Matching – no. I’m guessing if I popped into your house unannounced on a random Saturday afternoon, you wouldn’t be standing around in a line wearing white shirts and jeans. Right? Right! 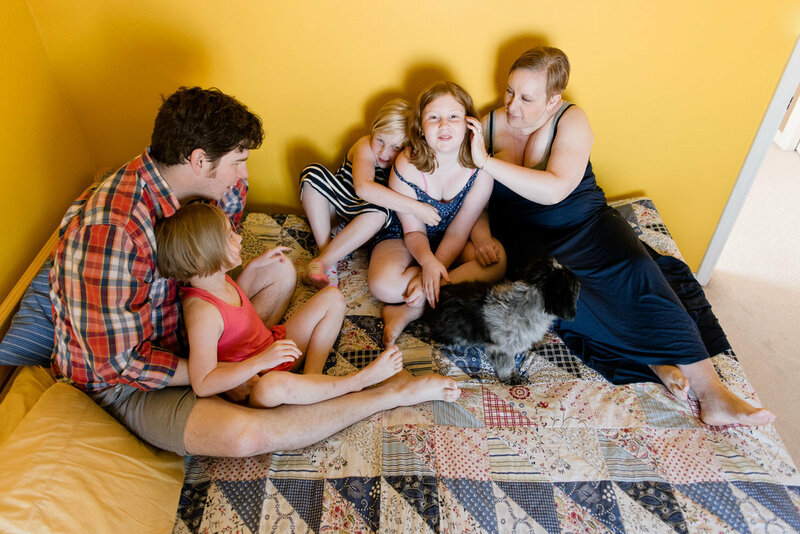 This is not your grandmother’s photo session. Your maternity and newborn photos should be a reflection of you. The person in the images should look and feel like you – even if you’re sporting a baby bump or a brand new squish. You have enough things to worry about in life (like a new baby! ), being uncomfortable in your clothes during a photo session shouldn’t be one of them. Now, that doesn’t mean you should wear your favourite Saturday sweat pants from 10 years ago (for the record, mine are Juicy Couture velour – right on trend 10 years ago! And boy were they comfy after baby!). What it does mean is you want to wear clothes that are well thought out, comfortable, and are a true reflection of you. Think cozy knits and skinny jeans. Flowy t-shirts and leggings. Leggings and sweaters. Maxi dresses with cardigans. You’ll want to stick with fairly neutral colours that will stand the test of time (because you’re going to flip through that album with your child years from now when he asks about his story). Bright, bold colours and vivid patterns will compete with each other and overpower your sweet new baby. Instead, pastels, jewel tones and basic neutrals will be the most flattering and easy to coordinate between family members. I recommend starting with what you’re going to wear and then selecting clothes for Dad, baby and siblings. 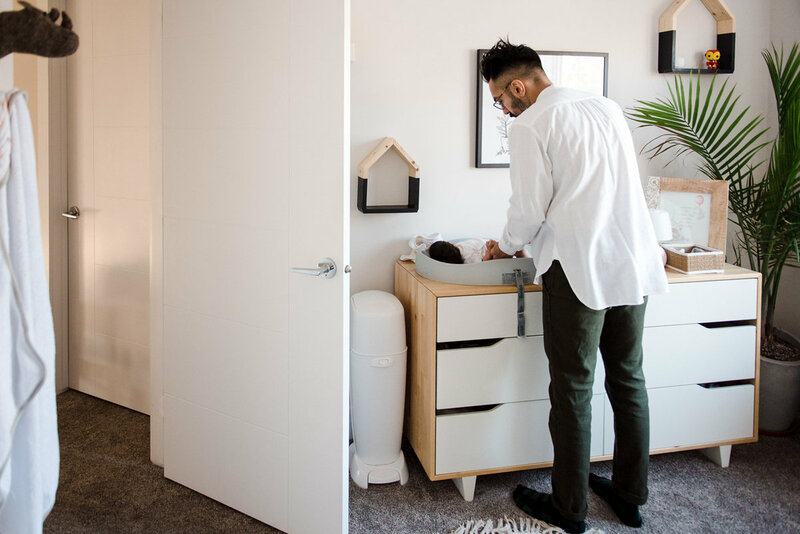 Men’s closets are generally full of neutrals, so once you know which colours you’ll be wearing, Dad’s clothes will fall in fairly easily. A few weeks ago I spent the morning at Yo Mama Maternity photographing some of their beautiful clothes to give you ideas of what you could wear for your photo session. When I was pregnant with both of my girls I bought multiple pieces of clothing at Yo Mama and they were my absolute favourite items – so it was a no brainer for me to collaborate with them for this guide. In fact, I bought a pair of black Seraphine maternity leggings at Yo Mama that I wore multiple times a week through 2 pregnancies and through that crazy fourth trimester. If I could still get away with wearing them, I would – they were that comfortable! You’ll also most likely be breastfeeding multiple times during a newborn photo session (new babies like to eat!) so I highly recommend wearing an outfit that is nursing friendly. Lucky for you, Yo Mama also has a large selection of on-trend nursing friendly tanks, tops and dresses. Ok, on to the pictures…. Even if you aren’t pregnant or nursing, you sort of want some of those clothes, right? I know! You can visit Yo Mama at 9522 170th Street in Edmonton or follow them on Facebook and Instagram for fresh maternity clothing ideas. 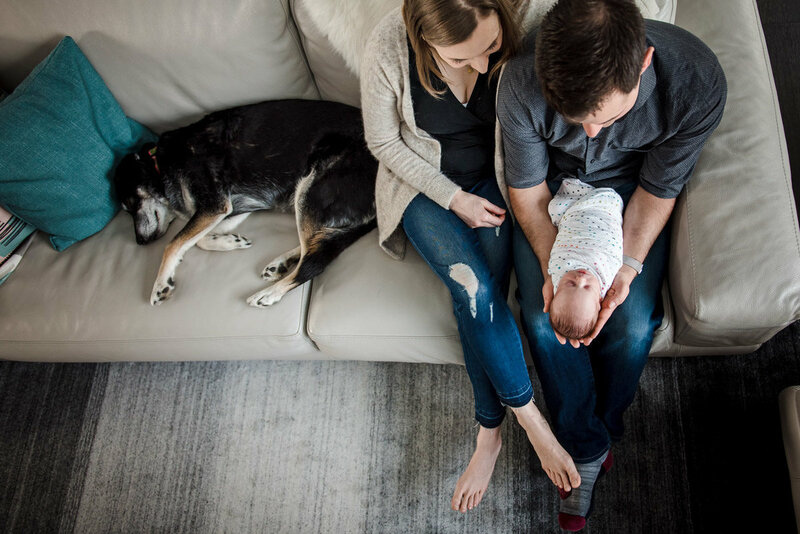 Fiddle Leaf Photography offers maternity and newborn photo sessions as well as packages to document your baby’s first year – from pregnancy through to turning 1. Contact me today and we’ll talk about your hopes and dreams for your new little one and how best to tell your family’s journey.